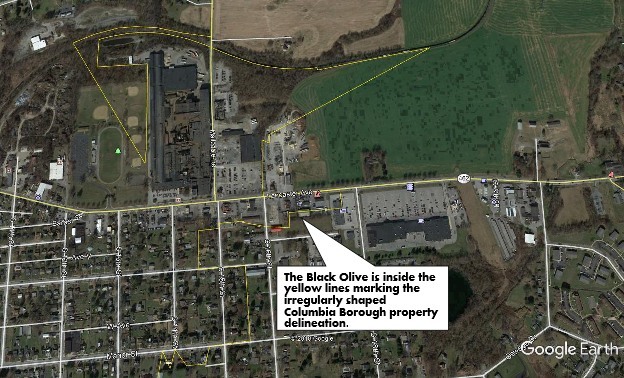 FAKE NEWS | So many local facebook posts and comments are uninformed and incorrectly state the Black Olive Restaurant is not located in the borough, but in West Hempfield Township. Here’s a GoogleEarth map showing the boundaries of the borough – the boundary is the thin yellow line. The Black Olive is in the borough; it gets inspected by the borough. This is an example of the fake news that facebook and other want to address. Fighting Low quality news? Another way of saying your only going to get the news Fakebook approves of. Sounds like a government mouthpiece. Maybe, though, there’ll be better fact-checking and maybe, there’ll be some algorithm that’ll identify someone’s belief or opinion as exactly that. Or maybe, people will actually take time to find verifiable documentation to support their views. Nah, that’d be too logical. Besides, the Internet (especially social media) is not really a research tool as much as a spewing tool. Fact checking is a joke. The all knowing Fact-check site by their own admission only checks on stories of interest. Another sham outfit. Mr. D. … we refer to demonstrable verification. Not it’s cold outside; rather the temperature is 27 degrees. It’s one of the reasons we audio record all public meetings and make notes in other situations. Data that is documented is real by our standard. Opinions, conversely, are just that opinions. And opinions are like rectums’; everyone’s got at least one., And this last paragraph is just that … an opinion. Fact: it would be uncomfortable to have neither. That yellow line could be made clearer by telling us on which side is the township and which side is the borough. In any event, The Black Olive is a fine restaurant. Wish we could do that, but it’s a google earth map so they have to do it. Recall we pointed out the “irregularly shaped” part of the border; it does get convoluted in that area. But the Black Olive is in the borough. I was just trying to learn what areas constitute the borough. Apparently the borough is below where the yellow line runs along the top edge of the Black Olive. Anyway, it’s good advertising for the restaurant. Only two things more confusing I can think of; PA liquor laws, and the Rt 30 interchanges here in Mannheim township. Just to add to the fun, why is it called Washington borough if its not a borough? Maybe I should just have a drink and go back to bed.